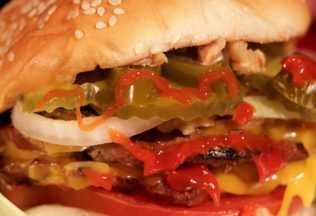 Health Star Ratings should be extended to cover fast food restaurants across Australia says a new report by The George Institute for Global Health. After analysing more than 1, 500 products from 13 leading fast food chains, researchers found the average health star rating (HSR) would 2.5 stars. Researcher, Dr Elizabeth Dunford, said extending the HSR system to fast food chains would help Australians make healthier choices. “We already have kilojoule labelling in large chain restaurants across much of Australia but that only tells consumers about energy content,” Dr Dunford said. ”Health Star Ratings on the other hand assess the full nutritional make up of a product, which is much more important health wise” she stated. Dr Dunford said that many consumers still struggle to use kilojoule labelling, but HSR perform well in terms of consumer understanding. ‘’Exactly as for packaged foods, what we found is that even in the worst performing chains, there are healthier alternatives, and the HSR would make them identifiable at a glance if it was required on the menu board,” she said. Co-researcher, Professor Bruce Neal, said whilst there may be complaints about HSR “it’s actually a pretty good system”. “It gets it right most of the time and consumers like it. We need to work to improve it, not trash it,” he said. The Health Star Rating Advisory Committee, which is responsible for overseeing the HSR system, is currently conducting a five-year review of the HSR system with public submissions open until 30 June 2017. Criticisms of HSR have come from different organisations over the years including AUSVEG who criticised the system for failing many vegetables. Consumer advocacy group, CHOICE, has also accused some food companies as “gaming” the system, saying HSR has been used to “health wash” some food products.